Working on examples of partisan polarization in U.S. politics? In addition to the sources recommended last run of the class, the library has added a new eCollection: U.S. History in Context. For example, here’s a search for “Political Polarization.” One could of course also search for specific polarizing issues (income inequality), proposed solutions (compulsory voting) or related element (supermajority). Need more statistics? The library recently added Statistical Abstract of the United States to its fleet of digital collections. Here’s their results page for U.S. election statistics. “Political Polarization results page.” U.S. History in Context. Gale Cengage. Web. 23 Feb. 2016. Researching polarization in U.S. government? Below are recommended research sources purchased by the library. The EbscoHost Academic Search Premiere collection will help to satisfy the academic article requirement; the additional sources will help you HH! CQ Researcher: Analytic reports, background and historical data, about 15-30 pages in length, focused on contemporary issues. CQ reports are designed to be written in an impartial manner and also include a pro & con on either side of the issue. Here’s their 2004 report on the same issue, in case history matters? Here also is a link to all the CQ Reports focused on Congress. One can of course search the contents of all the reports for key words (i.e. cloture). For some fast statistics, Statista could be helpful. For example, a search for ‘Primaries’ brings up statistics that might bolster an argument for Open Primaries. And yes, Ebscohost! Specifically their journal collection ‘Academic Search Premiere’. Their interface offers a relevant-enhancing subject search. Here is a search in Ebsco for a subject of “compulsory voting” combined with a subject search for “united states.” (Interesting that the eldest article is from 1949?). Also, most of the articles in this Ebsco collection are academic journals; there are some magazine titles in the database as well as an occasional newspaper. It’s possible to filter those out, using the limiters under the full-text check box (above), yet, they may still provide helpful information in a readable presentation. The library has also purchased from Ebsco the most current and full archive of 3 important periodicals that cover U.S. Politics (& other topics): The Nation, The National Review, The New Republic. All three can be searched at once. The SPS site license to the New York Times will likely offer some quality reporting on some of these issues. 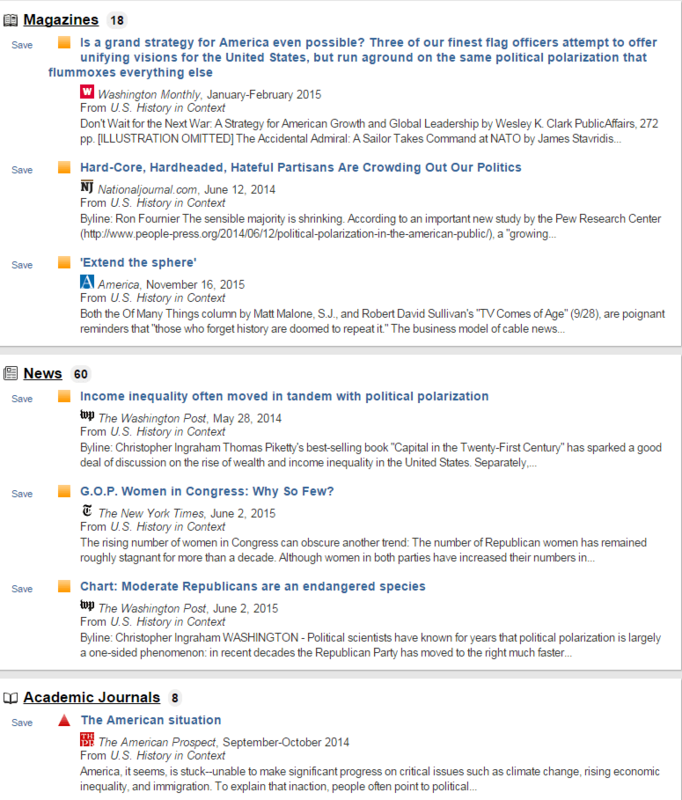 For additional newspaper commentary, the library’s subscription to National Newspapers Core, (from library vendor Proquest) offers a handful of major U.S. papers such as The Wall Street Journal, The Christian Science Monitor, The LA Times and The Washington Post as well as the New York Times in a text-only format.